The Dachshund “look” is hard to miss: low, long and short with a body that somehow stays solid and balanced in spite of its squat frame. Its convex head is erect and alert with ears that hang low and a pair of friendly oval eyes. The base of the neck slopes down to a protruding chest and a tighter abdomen, and the tail follows the line of the back. Miniature Dachshunds come in three varieties— smooth, longhaired and wire-haired—and colors can vary from solids of red, tan or yellow or combinations of chocolate, black and gray (among others). See Small Dog Breeds. Dachshunds may look cute and cuddly, but they are tirelessly energetic, clever and curious—some might even say “intense.” Always up for a walk or a game in the park, they can easily get bored when left to their own devices for too long. Sometimes, that can involve chewing things. Though very loyal to their owners, Miniature Dachshunds can take time to warm up to other people. This is not always bad: Their (sometimes) relentless barking at the sign of strangers makes them an extremely handy-albeit tiny-guard dog. 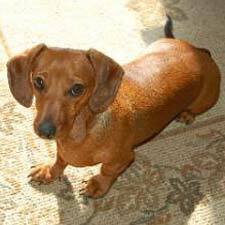 Miniature dachshunds are prone to back problems, due to their relatively long spine and short rib cage. If allowed to jump down from a bed or couch, they can easily slip a disk. For this reason, it is also important to hold them properly, supporting their full frame. A healthy Miniature Dachshund can live as long as 16 years, providing years of fun and companionship. A breed dating back to at least the Middle Ages, Dachshunds-coming from the German dach, which means “badger,” and hund, which means “dog” – were used widely in 17th century Germany as hunting dogs. Their short, sleek frames and an incredible sense of smell allowed them to hunt above ground, below ground and track animals for days at a time. Various sizes were developed over the years-i.e., smaller Dachshunds for hunting foxes and larger Dachshunds for hunting boar-and in 1895 the Dachshund Club of America began to promote the breed in the U.S. Dachshunds can be found in three sizes: Normal, Miniature and Toy.